In GNOME 3 (be it Fedora 15, Ubuntu 11.10 with Unity or GNOME Shell, etc. ), you can't move files or folders to trash by pressing the DELETE key anymore and you must use CTRL + DELETE instead. 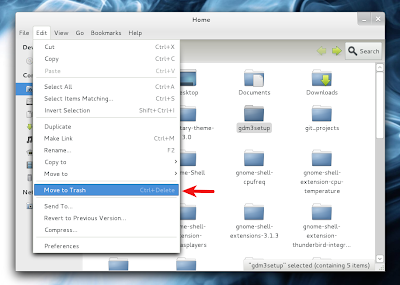 But you can restore the Gnome 2 behavior - just follow the steps below. The keyboard shortcut should change from "Ctrl + Delete" to "Delete". At this point, the "delete" key should be used for moving the files to trash, just like in Gnome 2.